If you have questions or feedback, please email us at Support@TimeformUS.com. You can also make a “comment” on any specific blog post. We check the blog regularly and will respond to your post. 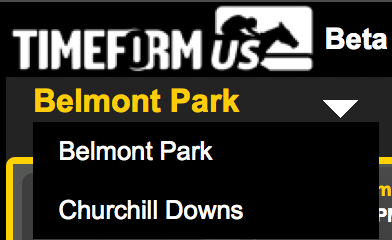 A: TimeformUS is a new digital past performance product which is optimized for tablets and the web, and will modernize the way horseplayers view past performances. TimeformUS Past performances are available exclusively for TVG Members for five tracks per day during this Beta period. Soon, TVG Members will be able to purchase PPs for most North American tracks. TimeformUS was built to work best on Chrome, Safari and Firefox on your PC, or Safari on your iPad. Q: How do I access TimeformUS Past Performances I’ve purchased in the TVG Store? A: After purchasing PPs for a day of racing at a track, you’ll see a link in the TVG Store that sends you to TimeformUS.com to access your past performances. If you purchase PPs for more than one track, use the Track Menu Drop Down on TimeformUS.com to switch between your purchased tracks. The free Race of the Day Past Performances will also be displayed in this Drop Down Menu. Q: How are the TimeformUS Speed Figures Created? A: TimeformUS Speed Figures are a breakthrough rating combining the horse’s final time, the pace at which the horse ran, and the pace of the race in which he ran. By combining a horse’s final-time figure, pace figures, and running style into one number, TimeformUS forms a state-of-the-art single-number measure of all-around performance. Q: What is the Spotlight Speed Figure? Q: What is the Pace Projector? A: The TimeformUS Pace Projector is a one-of-a-kind tool that is available for virtually all North American races. It displays the position TimeformUS projects the horses to be in at the opening quarter mile of a sprint, or the opening half-mile of a route. This is done by combining the horse’s habitual running style from his past performances with TimeformUS pace figures, forming a formidable tool for quickly understanding what a race is going to look like at the crucial early pace call in a race. I printed condensed form from the preview page, but there is no legend…How does one read them? Will Los Alamitos be covered Thoroughbred be covered? yes, the Los Al Tbred meet is covered. I need help bought today keeps saying my password is wrong but is not. drop us a note at TFUSsupport@drf.com and we’ll get it straightened out. I have a scale that I have used for horse racing and it goes like this: A+ 99,98,97,96/ A 95,94,93/ A- 92.91,90/ B+ 89,88,87,86/ B 85,84,83/ B- 82,81,80/ C+ 79,78,77,76/ C 75,74,73/ C- 72,71,70/ D 69,68,67,66. Should I use this for pace or speed figures? please email us at support@timeformus.com and we’ll get it sorted. Enjoying using TFUS PP’s. Would have liked to see an area dedicated to the BC, so will ask question here. Curious as to why Dancing Rags has a fig 6 points higher than Daddy’s Lil Darling. Margin was a length and both carried same weight. Don’t see any evidence in PP’s that course favoured closers. Hoping for some help and clarity. Daddy’s Lil Darling Pace 93, Speed 91 and was well back early. Fraction at 6f is in red too. Just email us at support@timeformus.com and we’ll get you sorted out. Are you compatible with the Microsoft Surface? We have heard good reports from customers using Microsoft Surface 3 or later, running the Edge browser. We don’t offer searchable individual horse or trainer stats yet. How far ahead can you purchase a dats entries? typically 3 days before the races. I purchased the $5.99 package for Saturday Jan 3. I loged out of the web site and wanted to go back in to get data for Laurel. How do get back into the web site without paying another fee? Just log-in again (top right corner of any page) and you will not be charged again for any of the races taking place on Jan 3. Choose another race date and you can buy a plan for that date if you’d like. I primarily use my Iphone for access. Does that work ? Also, will I be able to access all the Breeders Cup info thru the IPhone ? You did not answer the question if I should decide to cancel the monthly service at a later date, how does that work ? Iphone access is not 100% reliable right now, but will be later this year–not before the BC. If you want to cancel a monthly later, just e-mail us at support@timeformus.com. You’ll have access for 30 days starting from tomorrow. If I purchase $69.99 monthly plan tomorrow. Does my first month run from 10/9-11/9 ? Will you become compatible with Internet Explorer/Microsoft Surface in the near future? Nope, sorry. As we understand it the Surface only works with IE, is that really true? Are the fractional times displayed raw times or adjusted with track variant? If i toggle between the horses fractional times and pace figures, are they equal? Just displayed in a different format? I have been an avid fan of Mikes on drf and i am wondering how i can see his picks and will he be doing videos ? This web site is so 21st century: clear, clean, neat, organized, easily readable, written in a conversational and light tone…leaves DRF’s chaotic, ugly mess in the shitheap of history, where it rightly belongs in the post-Crist era. The others, like BRIS and Equibase haven’t been touched, it seems, since the 1980s, and they aren’t even embarrassed by that fact. You guys are a breath of fresh air. Yes, I’m going to subscribe once my BRISnet subscription is up. Say, just thought of this: are you planning to take on Formulator with trainer database queries and searches? What a great follow on the Pacific Classic. Way back when I was clocking at Santa Anita I can still hear clocker John Wilson(who is still clocking in SoCal) screaming about how the poles were wrong on Santa Anita’s infield turf course. I never pursued it, but have a great deal of respect for John’s opinion and wondered if your company has ever surveyed the infield turf course at Santa Anita. Wilson continues to clock at the so-called “off” track for I believe Andy Harrington. He knoiws what he is doing and has been at it for eons. how do I switch back and forth between PP’s and Pace projections???? Just tap on the pace projector graphic above the PPs.